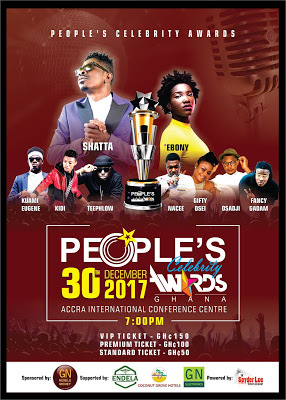 All is set for this year’s edition of the annual People’s Celebrity Awards scheduled for the Accra International Conference Centre on Saturday 30th December 2017. The event which is dubbed as the biggest night for players within the Ghanaian Creative Arts and Entertainment industry is announced to commence at exactly 7PM. Previously known as the GN Bank Awards, it is a scheme which seeks to award and celebrate individuals who have contributed as well as those that continue to excel in their various fields towards the development of the Ghanaian Arts and Entertainment industry. It is the only awards scheme which allows for nominees and winners of the various categories to be selected solely by the general public. Organizers of the awards, Spyder Lee Entertainment have this week unveiled the list of performers for this year’s event. Leading the pack are the biggest Ghanaian musician and the King of African Dancehall, Shatta Wale alongside currently the most sought after Ghanaian female musician and dancehall empress, Ebony Reigns. Other musicians confirmed to perform on the night are gospel music powerhouses, Nacee and Gifty Osei, the Lynx Entertainment duo, Kidi and Kuami Eugene as well as the pride of the north, Fancy Gadam. The god of Fante rap, the talented Teephlow and fast rising crooner, Osadji, are also on the bill. Tickets for the event are currently selling at Coconut Grove Hotels – North Ridge and Sakumono, Koala – Osu and Airport Residential area, MaxMark – 37, GN Electronics – East Legon, opposite Melcom. Tickets could also be purchased using the GN Mobile Money platform nationwide. The 2017 Peoples Celebrity Awards is sponsored by GN Mobile Money with support from Endela, GN Electronics, Coconut Grove Hotels and powered by Spyder Lee Entertainment.